Snow Capped Shepherd Rescueis a Denver, Colorado based, volunteer-run non-profit 501(c)(3) organization. We rescue abandoned, abused, neglected and stray White German Shepherds and German Shepherd mixes. We do not have a shelter, instead all of our rescued dogs are housed with caring foster families…a temporary stop on their way to happily-ever-after. The problem. The reason so many dogs and cats have to be rescued in the first place is that there are not enough homes. Too many dogs and cats are sadly born to die. By advocating spay/neuter for all companion pets, we strive to get to the root of the problem. Rescue is simply the band aid - spay/neuter is a solution. Do your part, spay and neuter your pets and encourage others to do the same. The solution. 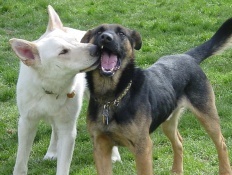 Rescue, foster and adopt White German Shepherd and German Shepherd mixes in need. Rescue. We rescue White German Shepherds of all sizes, ages and personalities. These dogs come to us from former owners, shelters or as strays. Sadly, shelters and humane societies are over-run with homeless pets and tragically must euthanize thousands of adoptable pets every month to make room for more. Did you know that 1/3 of dogs in shelters are pure-bred? Why would you need to buy a pet when so many are in need? "Don't breed or buy, while shelter pets die" a common mantra amongst rescuers. Foster. Foster homes provide care and love for these wonderful dogs while we work to find them permanent homes. Plus, by living in a true home setting, our adoptable animals become better prepared for their new adopted families. Adoptions. Matching responsible guardians with our adoptable dogs takes place through our adoption process. We carefully interview potential adopters to ensure that the right match is made. We ask questions about lifestyle, desired activity level, work situation and gather other pertinent information from potential adopters. Too often pets end up unwanted because they were never a good match for their previous home in the first place. At Snow Capped Shepherd Rescue, we look for people who intend to provide a home for a lifetime and understand what that requires. loving foster care to our Snow Capped Shepherds. on how your kids can have fun at camp too! Please help us, help Dane recover and reach his dream of Happily-Ever-After. We are in desperate need for foster families as we have several dogs waiting in shelters to be rescued. Please consider becoming a foster family to a dog in need. Get more information on fostering today! With great joy, we share with you the stories of our dogs that have found their way to Happily Ever After. Your generous support is appreciated! All donations go...straight to the dogs!